Size: 688 sq.ft. - 2170 sq.ft. Burj Vista was launched in 2013 by Emaar Developers in the wider Dubai neighbourhood Downtown Dubai. This project is being presented with a theatrical experience nestled between the water features Dubai Fountain & some mid-rise towers. Emaar Burj Vista is a development of two glittery residential towers. One of the towers is a skyscraper compromises of 69 floors high while the other tower stands 22 Storeys tall including boulevard level. Both the towers will going to house about 640 freehold apartments classification of high end quality ranging between the sizes of 788 Sq.ft to 2170 Sq.ft.. Gordon Gill & Adrian Amith architecture is the design consultant of this luxurious infrastructure. Currently 85% of construction works have been completed and estimated to deliver it by the end of 2018. The Opera style terraces of Burj Vista buildings offers you uninterrupted towers & villas front views & back view offers sea views for lifetime as in front of these two buildings no future construction is possible. It is linked to the newly opened pedestrian route which connects Downtown Dubai to Dubai Metro station. The first two floors of these towers will have deluxe retails. Burj Vista apartments are true work of local & international art appealing all kind of end users & investors where you can select from 1 Bed, 2 Bed, 3 Bed apartments, 4 Bedroom & 5 Bedroom Penthouses with the standard selling price from AED 1,400,000 to AED 11,000,000. The entrance lobby of the towers is going to attract you more, every individual unit are well organized over the ample carpet area of 786 Sq.ft to 1072 Sq.ft for 1 BR, 1271 to 1715 Sq.ft for 2 BR & 3 BR available between the are of 1750 Sq.ft to 2170 Sq.ft. Emaar Properties was founded in 1997 by Mohamed Alabbar the chairman of the company. It is a real-estate company located in UAE. Presently the Emaar Group is one of the largest real estate companies in UAE. EMAAR stands for Engineer Management Automation Army Reserve, EMAAR is quite famous for their large scale development of world's tallest tower Burj Khalifa. The group have been performing with the portfolio of Residential Property, Retail Spaces, Hospitality and so on. Shaping Dubai into the best residential destination all over the world. The marvelous constructions are very much appreciated by the people. Burj Vista is located in the most famous district of Dubai in Downtown. Downtown Dubai is a leader of all projects by Emaar. The residences of Burj Vista are faced to Burj Khalifa - The world's biggest tower. 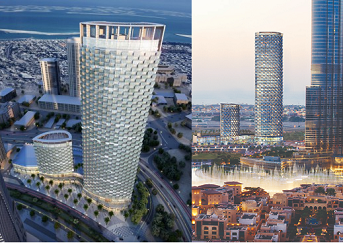 Burj Vista towers are very near from Residential Buildings, Metro Station & some mixed use development. Living in Burj Vista Downtown means you are connected to Opera District, Gaming Zones, Theaters, Retro Stores, Restaurants, the business district and Dubai Mall the biggest paradise within walking distance featuring Marine Zoo, KidZania, Dubai Aquarium, Reel Cinemas, Ice Rink and many entertainment sections. Gems Wellington primary School, Horizon School, Jumeirah International School and Dubai Modern High are world class & best education institutes with top grade faculty in Downtown Dubai. All ongoing projects in Downtown Dubai is getting huge response including Burj Vista residences. Emaar's twin tower project is located on Mohammad Bin Rashid(MBR) Boulevard a minute away from Burj Khalifa in Downtown, Dubai, UAE. * 24 Hour security with key card security access.